The fish kill story in Batangas and other provinces was catastrophic, not only to the businessman but also the fisherman. We as a consumer, were also afraid of buying milkfish or bangus and tilapia. But just before the fish kill tragedy, we cooked a grilled milkfish for dinner with stuffing of our favorite tomatoes and onions.. made our dinner a sumptuous meal! yummy! 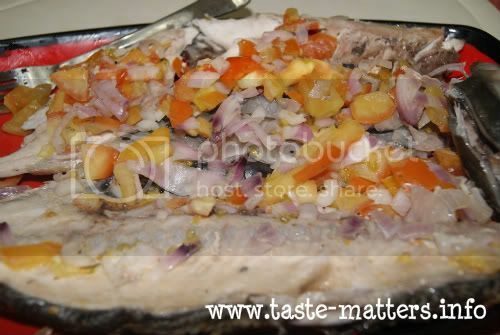 i miss eating bangus na hehee..
My first YS post is up here. the last time we had milkfish was in February pa! waaahhh! i like bangus when it's marinated and then fried. visiting your YS entry! hope you can visit mine! wow! that looks delish sis! hope you could visit my entry at http://www.eatdrinkblog.info/mixed-fruit-shake/ thanks! ayy ang sarap! gusto ko ung mga ganyang ulam lalo na pagnaka-kamay kumain! hmmm yummy! Check out my POTLUCK DISH which is everybody at the campsite's fave! See yah! The news about the fish kill is devastating. Those two fish are the only ones that I eat and now I can't because of what's happening to them.